While we try to focus on Cincinnati in this blog I want to take a few minutes of your time to talk about beer in Atlanta. Part of my family and a friend have moved to Atlanta over the past few years and the city hosts a decent beer scene. While they don’t have nearly as many breweries as us they do have one that is noticeable more massive. There are also many good bars and beer stores that provide a nice variety of stuff we can’t get here. After living in Cincinnati with all our breweries I’d think a city the size of Atlanta would have a lot more. 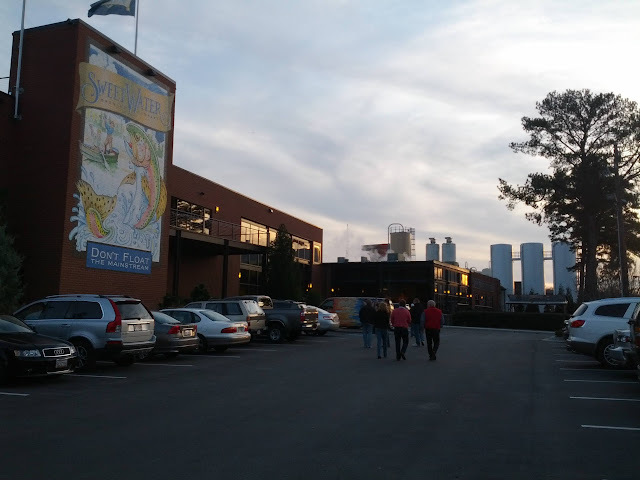 While they only have about a third as many individual breweries their biggest one, Sweetwater, is far more massive than anything in our area (not counting Sam Adams). The brewery is a bit north of downtown Atlanta and located right-off of I-85. The hours are 5:30 – 7:30 Wed, Thur, Fri and 2:30 – 4:30 Saturday… or something like that. Free tours and $10 for a pint glass + 6 5.5 oz samples. Getting there at 5:30 isn’t the greatest idea as there was a line out the door, but by 6 the line was gone and the bar area was jam packed with people. My friend and I basically spent our time there standing in line, getting a fill, moving to the end of the line, and repeating. Sweetwater is most notable for their 420 pale ale, which is an good pale ale and I strongly recommend trying if you see it. However everything else I’ve had from them has failed to impress, it’s all good but not great. There is also Red Brick brewing, Atlanta Brewing Company, and 5 seasons. I’ve had a few Red Brick’s and they are quite good, but again not amazing. While technically an Athen’s brewery Terrapin is wide spread in Atlanta and is well worth seeking out. Terrapin’s Hopsecutioner and Moo Hoo are both excellent standard beers, they also make a plethora of amazing one offs. Bar wise there is the Brick Store Pub in Decatur (east of downtown) and around the corner is Leon’s Full Service. Leon’s is a restaurant with an amazing burger, a curious/excellent selection of sauce to dip fries in, and of course a rocking beer menu! Despite the awesomeness of these places I spend most of my bar time in Atlanta at Taco Mac. Because my family lives in the far north-east suburbs, they carry Bengal’s games, and the beer menu is out of this world! 50 some taps and another 100 or so bottles. Plus the beer menu has great info like brewery location, style, ABV, I just wish they’d add RateBeer or BeerAdvocate ratings. Taco Mac also has some pretty good food, but it’s typical Buffalo Wild Wings type fare of burgers and wings. A lot of folks I know from the Cincinnati area don’t stop in Atlanta often but are more likely to blow through it on their way to Florida. In that case you should add an hour or two into your next trip for a stop at Hop City. Hop City is next to Gerogia Tech right off the I-75 corridor north of downtown. 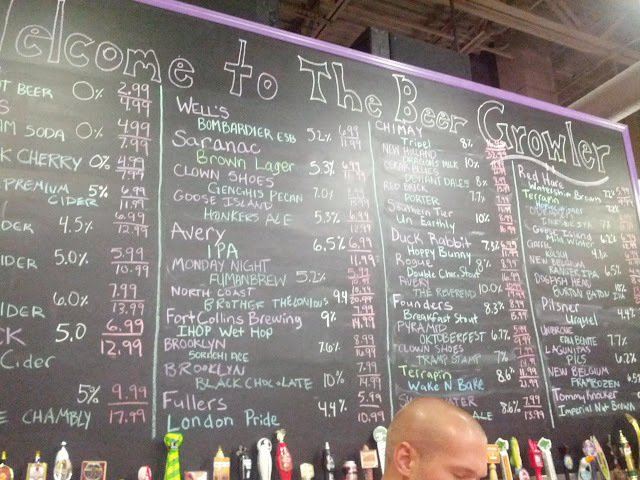 They have an impressive beer selection with decent pricing as well as about 50 some growler taps, no tastes though. Growlers appear to be a pretty big thing in the Atlanta area with many places filling growlers and 1 chain of stores dedicated to that alone. The Beer Growler chain worked hard on getting Georgia laws changed to allow for growler fills. Luckily they have a store out by my family so I stopped there twice during my week in town. Prices are a bit stepper than we’re used to around Cincinnati, but we also usually get stuff straight from the brewery. If you’re headed to or through Atlanta you should visit at least one of the stores above and bring back some goodies, like all the Clown Shoes you can carry! If you know any other beer hot spots in Atlanta please share in the comments. A pretty good bottle shop is Ale Yeah! with two locations, one in Roswell which is fairly new and the original location in Decatur. Guys were very nice and had a a really nice selection including a good growler station.